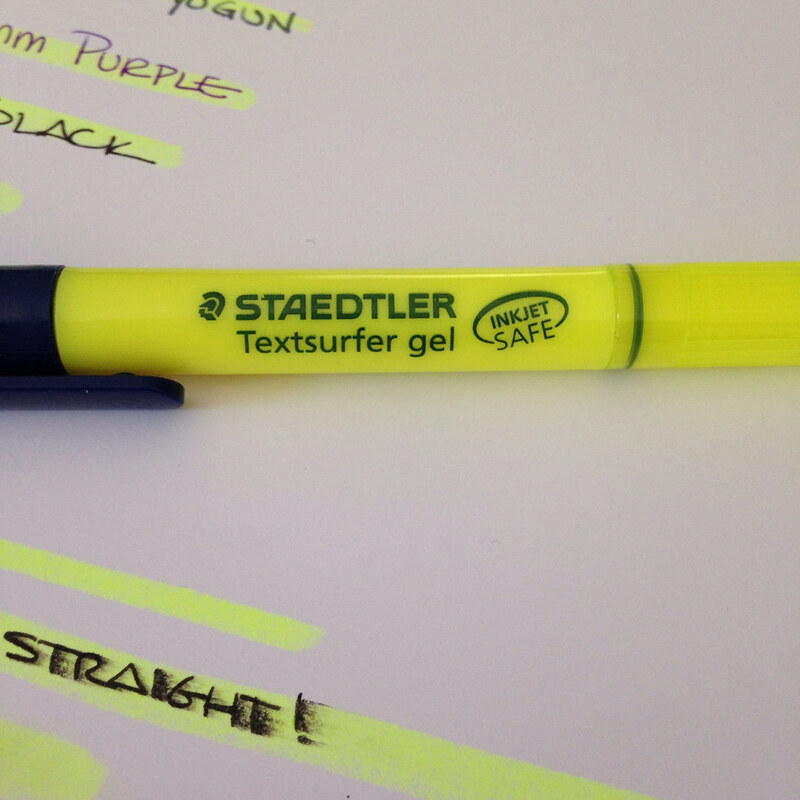 I'm a huge fan of highlighters and especially like the Staedtler brand. They work well and aren't too smeary. Before we get started with the review, did you see that I'm giving away a brand new Lamy Safari Fountain Pen? It's the new Neon Coral color and still have time to enter to win. When I saw the Textsurfer Gel, I picked one up with hopeful skepticism. I'm not sure what I expected, but it wasn't what I saw when I removed the cap. They reminded me of the Crayola Stick Slix (do you know those?) and I was immediately concerned about smears, bits of the gel flecking off, and having a product that would be consumed very quickly. 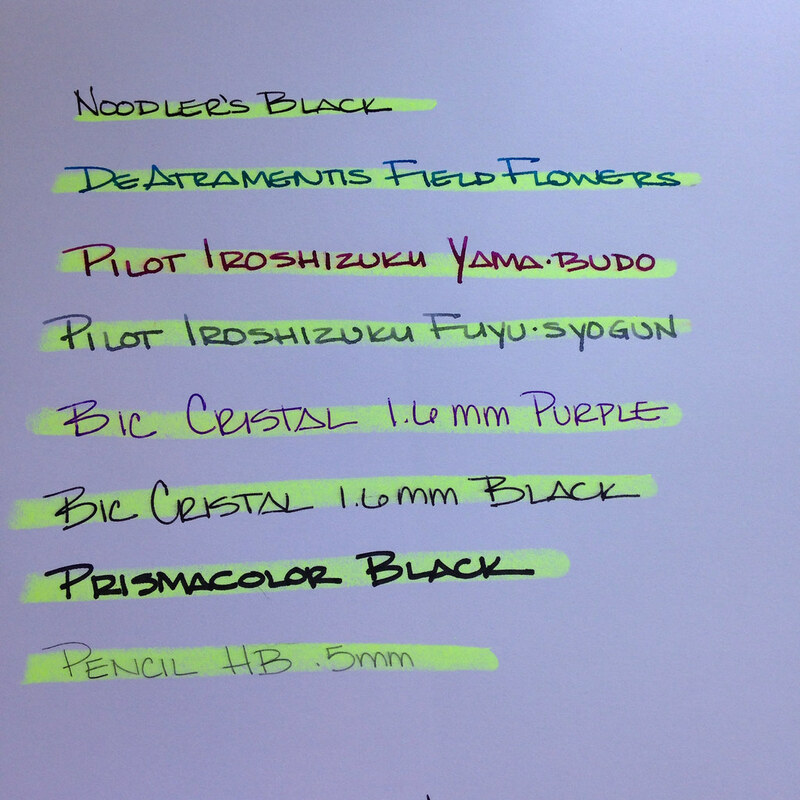 Using HP 32 lb paper, I tested four fountain pen inks, two Bic ballpoints, one marker, and one pencil. Before swiping the Textsurfer across the writing, I made sure the inks were dry. Overall, it went very well as far as smeariness goes. There was definitely a somewhat sticky gel residue left on top of the paper. 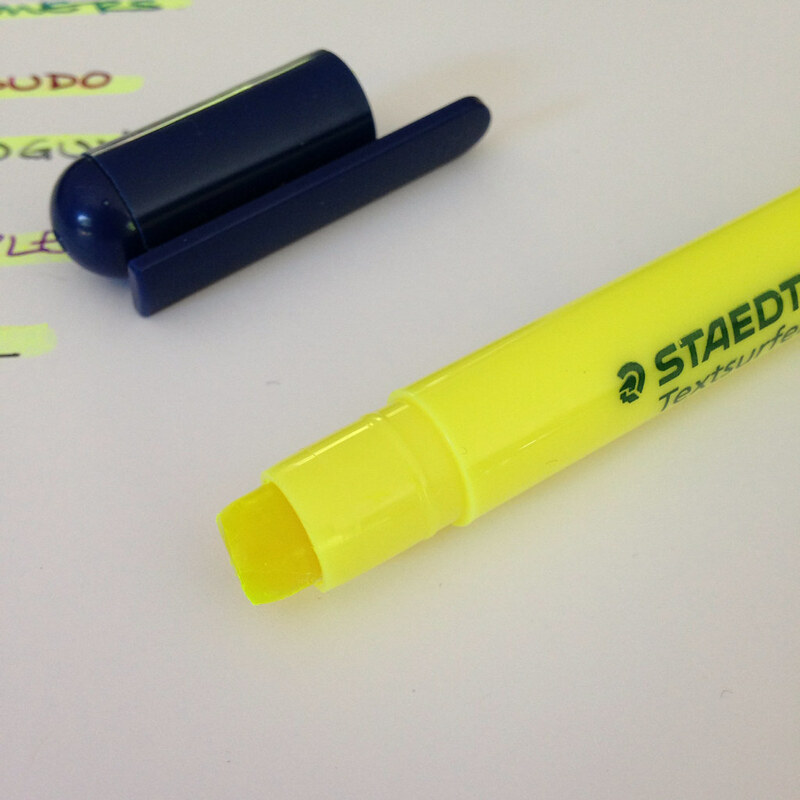 Surprisingly, over the course of a few days, that went away and what was left looked and felt like any other highlighter. Imagine that gel residue if I'd been highlighting in a book and closed the page? Ew. 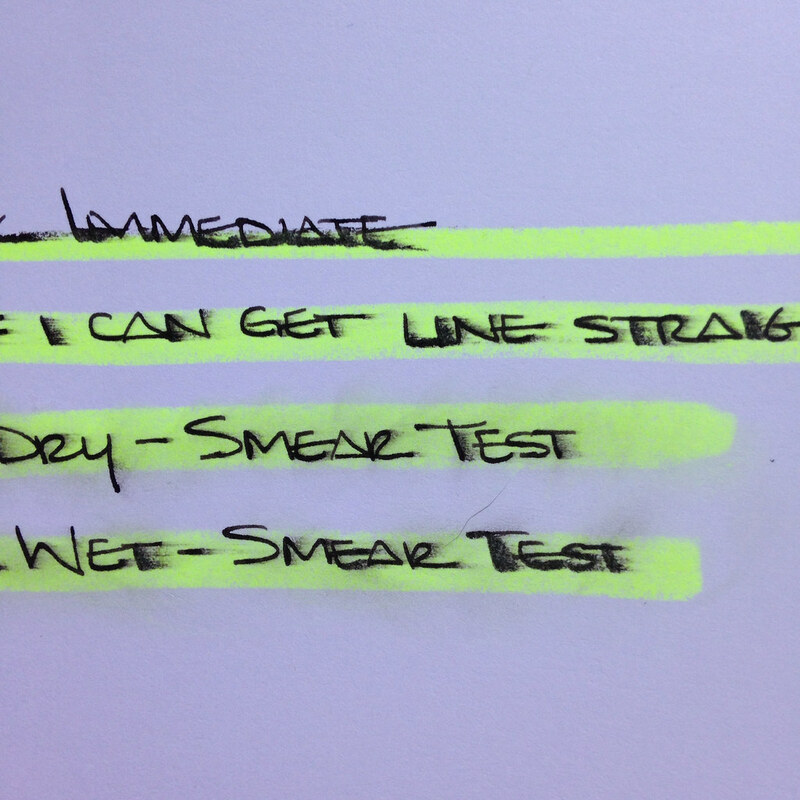 I then did some in-depth testing with Noodler's Black . . .
My final analysis . . . It's ok (not great). My fear of flecking was not realized (good news!). The sticky residue is troubling, but not terrible for single sheets of paper that aren't going to be stacked. The cap cannot be posted - irritating, for sure. I wouldn't buy another one of these. Have you tried this? What is your favorite highlighter? 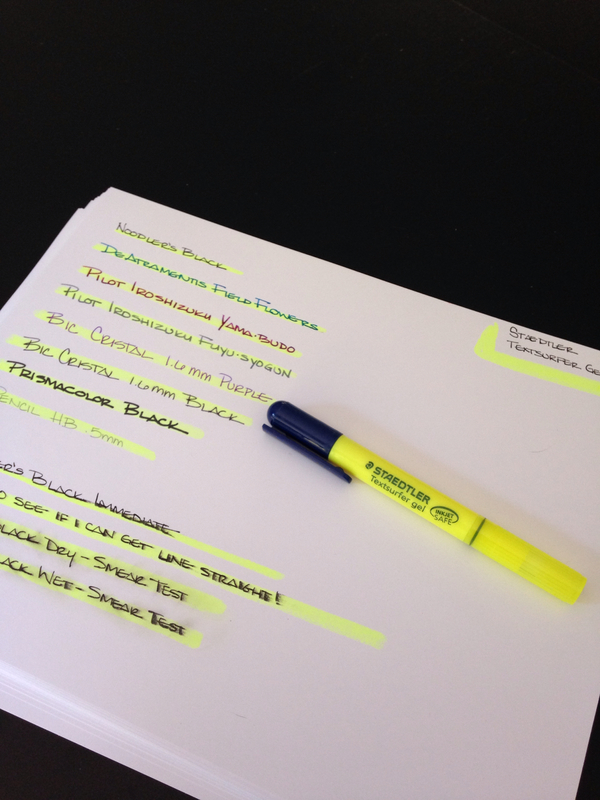 I have some of the Noodler's highlighting inks. Need to get them loaded and tested. Very cool! I've wanted to start using a highlighter, but cheap paper + fountain pen ink + highlighter = black streaks, so I've stayed away. I might try some highlighter inks in the future in a Preppy. On a side note, did you say what size nib you got on the giveaway Safari? Not that its a deal-breaker (especially for a free pen), I was just curious. Thanks! Hi Dylan...thank you for stopping by. I believe the nib on the Neon Coral is Broad. I have reviews of more highlighters coming up - stay tuned!